497686 products found in Child Safety. Your request for Child Safety revealed a total of 6497686 results. Product Features: EASY FIT! 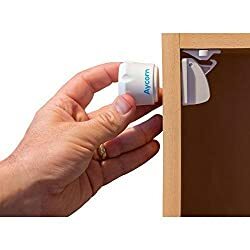 Unlike other brands your baby proofing locks have a specially designed installation adapter and high quality easy follow instructions. 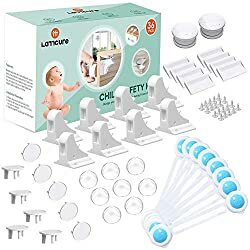 They are super quick and simple to fit in just seconds with no need for a tape measure, tools, glue adhesive or guesswork., SUPERIOR PERFORMANCE! Powerful mini magnets in our keys means that doors up to 38 mm (1.5") thick can safely be secured better than some other childproofing lock and latch kits. They are perfect for all around the home such as the kitchen, living room, bedroom & bathroom., TOP QUALITY! Your childrens and toddlers locks are made with premium quality materials and are thoroughly tested ensuring long term security of cupboards, cabinets and drawers and your continued peace of mind. Also features a simple 'open / closed' setting for your convenience., NO MESS! Aycorn locks use extra strong 3M self adhesive easy peel tape which means no drills screws or other equipment are required. 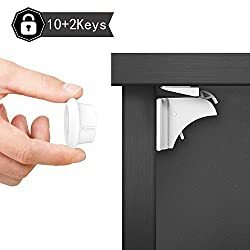 There is no damage to your furniture or doors and spare tape is provided in the pack so you can easily remove and re-use them in the future., 1 YEAR 100% SATISFACTION GUARANTEE! Love your lock set - or your money back! Not only do you get a 30 day manufacturer warranty but we also offer a 1 year 'no questions asked' replacement guarantee - that's how confident we are you'll love your product., Keep Your child Safe - The magnetic child safety lock is to keep your curious little kids away from drawers and cupboards filled with dangerous tools or chemicals with simple, allowing you to have peace of mind while your children explore your home.